Regular maintenance and trimming keep trees healthy and encourage fresh and new growth for them. It is very important to trim trees correctly so that you don’t interfere with their natural healing process. Incorrect tree trimming or pruning not only makes trees weak and vulnerable to diseases, but can even kill them. You can go for professional tree trimming services so that you do not damage the bark and have to remove a dead tree later on. Remember that the branch collar is responsible for forming the scar tissues in trees. Never flush cut the branches off with the trunk because if you cut into the branch collar, the tree will have a very hard time recovering. Mostly the rotten holes in tree trunks or seeping wounds that you see are the after-effects of cutting off the branch collar. The notch cut: Here you cut a small notch at the bottom of the limb, generally 3 feet away from the trunk, and about a quarter of the way through. Creating a notch cut is safe and fast and keeps the bark from splitting when you make the next cut. The relief cut: Once you have created the notch, make a relief cut completely through the branch. This helps to remove the weight of the branch, so that you can make your final cut without the branch splitting and falling. The final cut: Your final cut should be right where the branch collar transitions to smooth branch bark. Follow the slant of the branch collar and cut it at an angle. If you can’t fit your saw into the crotch at the right angle, cut it from the bottom at an upward point. Using these cuts is the best way to trim a tree because it will not only save trees from dying, but will also facilitate the healing process for them. 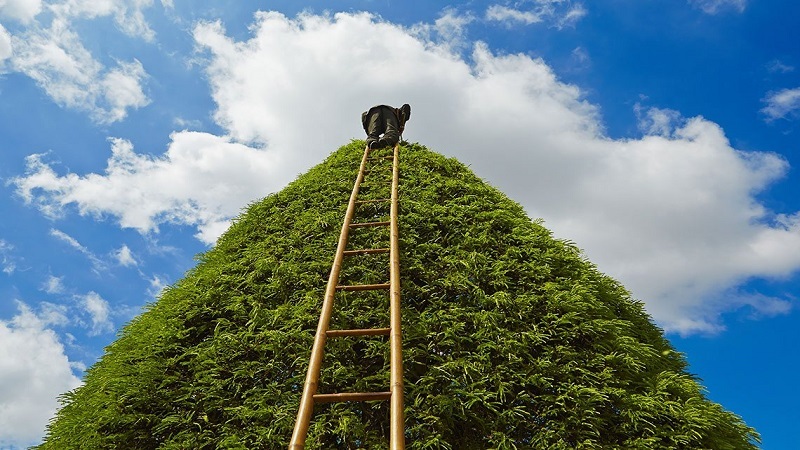 If you are looking for the best and quality tree trimming and removal services in Dana Point, CA, you can contact Dana Pacific Landscape. We have the knowledge and expertise to trim a tree without killing it. Call us today! This entry was posted in Landscape Design and tagged How to Trim a Large Tree, How To Trim a Small Tree, How to Trim a Tree Without Killing It, Tree Trimming Guide on January 23, 2018 by Socorro González.